Enjoy free style dance to the rhythms of world and tribal music. 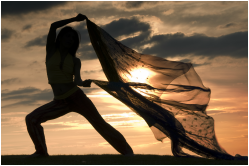 Unleash your inner dancer and experience the healing power of movement! See what it feels like to really own and claim your truth, your voice, your body, your impul﻿﻿se. Ecstatic dancing is an opportunity to take a journey within, and allow your body, heart, and soul to express themselves freely. Such dancing is uplifting, healing, and balancing on very deep levels. At the end of the dance, we feel exhilarated and meditative, peaceful and happy, and we feel a release of "our stuff" on many levels. Leaving our expectations behind, we merge with deeper aspects of ourselves. We will have an opening and closing circle. We'll dance in silence which allows us to go deeper into the experience of body movement and non-verbal connection through dance. No experience necessary, only a willingness to move and be moved. Unleash Your Inner Dancer and Let You﻿﻿r Body Move!